NOTE: Your address must match the address on your photo ID (driver's license or other state-issued identification) and must match the location of our home visit. You will be required to present the identification before you can adopt a bulldog. Please note: We will contact your landlord to confirm that your lease allows you to keep pets on the premises. How long do you expect to be at your current residence? Describe home in relationship to stairs: Please indicate the number of stairs in each area. If yes to any of the above, how will the Bulldog be kept out? Where will the Bulldog sleep at night? Where will the Bulldog be kept when no one is home? How many hours will the Bulldog be left alone at any one time, and how frequently? Please list all pets (dogs, cats and others) owned now or in the past 3 years. Please comment on the nature of each pet you have. If you have had more than three pets in the past three years, please describe in Comments section. If any pets listed are no longer with you, why not? Note: Please list ALL vets who have treated your pets. You may provide that info in comments. We may ask you to contact your veterinarian and give permission for release of information. What types of problems would you not be willing to accept? Who will care for the bulldog during your vacations or overnight trips, and where will the bulldog be? All Bulldogs adopted from us will be spayed/neutered. I understand that I will be asked to give a donation to MidAtlantic Bulldog Rescue to help with the spaying/neutering and veterinary care of current and/or future rescued Bulldogs. Generally, the donation is $500, although in some circumstances the donation varies. I have answered all the above questions truthfully to the best of my knowledge. I understand that if, for any reason, I can no longer care for or keep the dog, I must return the dog directly to a MidAtlantic Bulldog Rescue member, pursuant to the terms of the adoption contract, and I will sign all necessary papers for the surrender of the dog. I hereby make application to MidAtlantic Bulldog Rescue to have my name added to an appropriate waiting list for the purpose of giving a Bulldog a permanent home. I understand that it may be important for me to be available for an interview by phone or in-person on short notice. I further understand that I will be required to sign a copy of the application before an adoption will be arranged. I agree that if anything on this application substantially changes after I submit the application, including if I acquire a bulldog or any other pet, I will contact MidAtlantic Bulldog Rescue and fully disclose what has changed. I further agree to notify MidAtlantic Bulldog Rescue immediately if I choose to withdraw my application. We encourage you to review your application carefully before you submit it. Please review your email address to be sure it is accurate. PLEASE NOTE that we do not routinely make personal contacts in response to new applications, as we receive a large number of applications every day. However, we will contact you by telephone or email if we need more information from you or you are being considered for a possible adoption. The waiting time to adopt a Bulldog can vary from two weeks to years. Copyright © 2007. 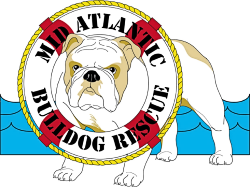 MidAtlantic Bulldog Rescue. All Rights Reserved.